January | 2012 | Get Glenn Mobile! I know, I shouldn’t wish any of my precious time away, but I was looking at two of my Christmas presents today…it’s gorgeous weather out…and got to pining for the warmer weather. As you may recall, I went out almost every morning with good (and even not so good) weather this past spring, summer and autumn to indulge my love of aviation with my ultra micro R/C aircraft. All of them are in fine shape and I’ll be flying them, but now I’ve got a couple more in the hangar. 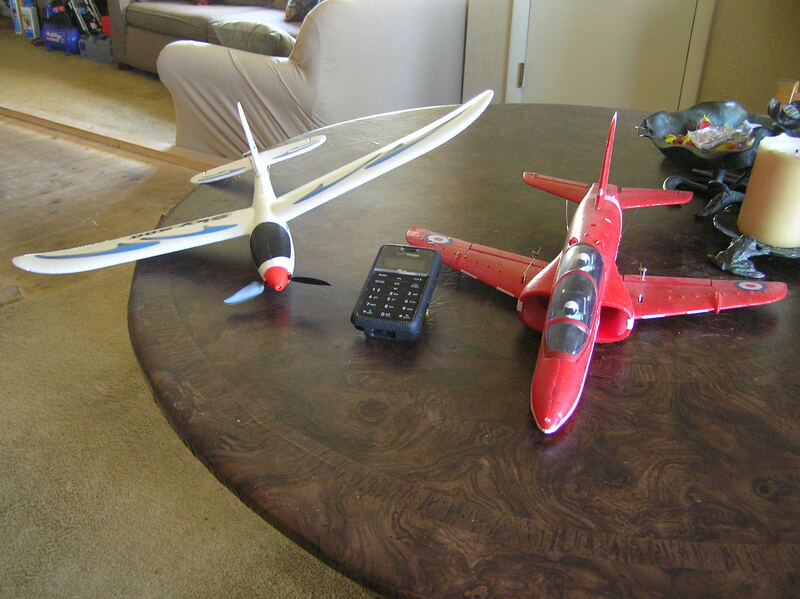 I’ve already talked about my nano Red Arrows-schemed Hawk electric ducted fan jet model, shown here on the right. I’ve been applying some hobby-type TLC to an already decent machine to get it ready to really perform, and the Sky 500 on the left just arrived from China, a gift from my friend Karen. Incidentally, that’s my cell phone between them included for scale…these guys are small! It’s another item that was sheer fantasy a few short years ago, a capable radio controlled sailplane that only weighs 40 grams, yet can climb under its own power to the altitude of choice, where the pilot can shut down the motor and cruise around looking for areas of rising air to stay aloft, soaring just as full size sailplanes do. To minimize drag, the propeller blades fold once the power’s off from the pressure of air passing it. I used to love flying my 6 foot span glider at the nearby Percy Priest dam here in Nashville, but haven’t been able to do anything like that since becoming disabled and stuck in the house…until now! My new favorite vendor HobbyKing just started carrying these, so it was a natural choice when Karen told me she wanted to get me something nice for Christmas. If anyone seeing this wants to try one, HobbyKing has just added them to its US-based warehouse. Inexpensive to begin with, now you can save the time and money you’d spend if ordering it from Hong Kong. It’s ready to fly, including the needed transmitter with four AA batteries and one tiny rechargeable lithium polymer flight battery (I ordered a few extras so I can fly as long as I like, at about a buck each it’s no strain on the budget) and it’s entirely assembled…charge the flight battery, bind the transmitter to the plane’s receiver, and off you go! It’s remarkably easy to fly and made of crash resistant EPO foam, a heck of a deal for new or experienced pilots. Yep, it ought to be a very fun spring! Wow, I’m in a good mood! It’s been a week, for sure, I already wrote about the fiasco that plumber caused and the generosity of the couple who replied to my craigslist ad and sent the plumbing company that cares for their rental properties to take care of it. I hadn’t mentioned that the first guy told me he’d seen that my bathroom flooring was in bad shape while he was under the house…one more worry I can’t afford to deal with. Well, not only did that first guy break the pipe that needed fixing to gin up another lucrative job for himself, but his story about the bathroom flooring turned out to be whole cloth as well, confirmed by the second plumber while he too was under the house. Mr. Roto-Rooter either does flooring or has a pal who does it…busted! Today, since I was on a roll with the fix-it stuff, I hauled in my compressor that I used for airbrushing some years ago…until one day it started making a nasty clattering noise and quit charging the air tank. I almost threw it out, but held onto it on a hunch. It’s a midrange quality compressor and a new one would cost over a hundred bucks, so if it was fixable I figured I’d give it a shot. When I removed the cover from the air pump today, I saw the cause of the failure and the noise immediately…the slim copper pipe from the pump to the tank had fractured. I removed it…all 2 ounces of it, and called the manufacturer. Five bucks shipped, and it’s ordered and enroute. A few minutes’ work and I’ll have my nice compressor back for airbrushing and cleaning the dust out of my computer. You gotta love it when a plan comes together…if my plans for another ‘publicity bomb’ work out, this could end up being a spectacular week! You know, sometimes a thought will strike me that’s so simple and straightforward I can only wonder why it hadn’t occurred to me earlier. Months earlier, in this case. It’s far from a sure thing, but I may have come up with one good solution for attracting new viewers to this blog…and the segment of those viewers who are likely to donate to the cause. I’ve thought of the concept before, it was implementing it that had me stymied. Hopefully details will follow soon. Just a quick follow-up to yesterday’s post about the chaos that the Plumber From Hell caused on Friday, and it’s a good one! I’ve had some terrific experiences with craigslist here in Nashville, so yesterday on a hunch I posted an ad detailing the very basics of what happened and asking if any readers were plumbers or knew of plumbers that could repair the pipe the guy broke on Friday without charging a king’s ransom. Lo and behold, a lady responded today asking for my phone number. I just finished speaking with her and it seems her husband employs a plumber to service his rental properties and they’re willing to let him take care of our pipe repair here, and they’ll compensate him. Again, we see that there are many people who when alerted to someone in trouble pitch right in to help. I’ve been a bit on edge trying to work this out, but this one person’s actions have made my week! For whatever mysterious reason I seem to be surrounded by good karma, not only with my quest to regain my mobility, but in general, and am feeling particularly blessed today. While there are certainly plenty of rotten eggs in this world, people like my Good Samaritan are ready to counteract their evil! I’ve found over the years that when things go wrong, stuff tends to happen fast. A couple of nights ago, my mom decided to throw out a quart and a half of leftover cole slaw taking up room in the fridge. The problem began when she decided it would be a good idea to put it down the garbage disposal in the kitchen sink…and you guessed it, the drain clogged solid. I figured it wasn’t the biggest deal in the world, but I haven’t needed any household work done in a few years and didn’t have a current reference for a local plumber, so after seeing nothing of note on craigslist I tried Nashville Citysearch, the online reviews site that’s served me well several times before when researching local businesses. Sorting the results by ratings, I was a bit surprised to see that the hoary old standard Roto-Rooter was about the highest rated service and contributors mentioned they had very competitive prices, so I gave them a call. I was a bit leery since I’ve found many times that Big Name outfits weren’t as satisfying to use as smaller companies that tend to be leaner, meaner and more efficient, not having a well recognized name supporting them, but…what the heck. To their credit the service fellow showed up within a half hour. He took a cursory look at the sink, retrieved the power snake from his vehicle, and got to work. 15 minutes later, the job was done, the drain was clear and he’d replaced the snake in his truck. Then the fun began. My mom asked him to look at a faucet in the bathroom that had developed a bit of a drip. Sensibly, he asked me where the water cutoff valve was for the house and I pointed out its approximate location on my front lawn. Unfortunately, it seems to have been a bit overgrown by some nearby junk foliage that the fellow who does our lawn cutting was supposed to have cut back this summer, but didn’t. The fellow looked for the valve for a couple of minutes, then gave up, retreating to the bathroom. I figured he was simply going to examine the offending faucet and proceed from there. Two or three minutes later I heard a yelp of dismay from the bath, followed by the unmistakable rushing sound of a large amount of water suddenly let loose. “Pipe let go!,” he yelled, and came tearing back to the living room. “I gotta find that shutoff!,” he cried, heading for the lawn again. Under this much stress I doubted he’d see the cover for the shutoff valve even if it was in plain sight, and followed after him, feeling pathetically useless as I rolled along in my chair. By the time I got to the street he was already running back to the house. “There’s gotta be a cutoff in the basement!” he exclaimed over his shoulder as he rounded the corner and I turned to follow, trundling along. Dumping an emergency situation on someone with my kind of disability is a bad idea, not only because I move so infuriatingly slow but because as I’ve mentioned before, trying to digest new information is tough since MS steals my brain’s RAM, to use the computer analogy…I could feel my brain locking up like an obsolete computer asked to multitask. If this man had asked me, I’d have told him that there were no valves in the basement; it’s a part of the house that was added well after it was built. As it was, I could only return to the living room to wait…remember, I haven’t been able to get to the basement for years since I lost the ability to walk, much less deal with stairs. My mom hadn’t been idle, thank goodness, she’d fetched a plastic garbage container from the kitchen as soon as she heard the guy holler and was now collecting and bailing water that was geysering from the broken pipe under the bathroom sink. After several minutes, the man emerged from the cellar looking defeated. He asked me how he could gain access to the affected pipe and I informed him he’d need to get there via the crawlspace under the house. He headed that way and a few minutes later the sound of the water stopped…he’d found the cutoff for the water to the bath. Still overwhelmed by the situation, I went in search of my little cat, Vya, who’d disappeared in the fracas, worried that this guy might have let her get outside in his frantic haste. I didn’t find her outside and assumed she was hiding from the commotion somewhere…at least I hoped she had. She did in fact reappear later, cautiously emerging from the cellar where she’d been hiding like a soldier who’d been in a firefight coming out of a foxhole. I returned to the living room and was surprised to find the service tech already going over paperwork with my mom. He’d just charged her $250.00 just to clear the clogged drain, and had prepared an estimate of over $900.00 to repair the broken pipe! He then packed up and left, promising to return on Monday to do the work. Uh huh. For my part, I was so tipped over from the assault of the mountain of data needing processing that I headed for bed, where I collapsed for almost 9 hours, only getting up late in the evening last night. I know, it sounds like I’m a wuss, but try not to judge too harshly, that’s the effect of overloading someone with the cognitive issues brought on by MS.
You’ve probably heard stories of unscrupulous workmen taking advantage of the elderly or disabled…I do believe I just experienced that. Looking back today after some rest that allowed my frazzled mind to calm down, everything that transpired seemed just a wee bit contrived. That workman shouldn’t have touched a suspect water line without locating and using the cutoff for the main water supply…his actions were entirely unprofessional. I don’t doubt that that piece of old galvanized pipe was old and weak, but I’d replaced that faucet myself just a few years ago when I was only beginning to be affected by multiple sclerosis and hadn’t had a shred of trouble. I’m going on instinct and have a sneaking hunch that this workman saw an opportunity to generate a nice lucrative repair job and went for it. The fact that he immediately presented my mom with a huge bill for his 15 minutes’ work in clearing the clogged drain as soon as the emergency was contained but the overall chaos was ongoing supports that suspicion, too. This has been a real learning experience. I postponed the scheduled ‘service’ call for Monday with Roto-Rooter and obtained a recommendation for a smaller local firm from my new ally Caleb who’d visited the night before with his wife, a service they’d used themselves before. Even with his praise for this company, I plan to take my time and assess each step before proceeding, and won’t allow such a situation to develop again. I plan to have a nice chat with the manager or owner of this Roto-Rooter franchise, too. $250.00 for fifteen minutes of relatively easy work? Really? I’ve never encountered a home service of any sort that can charge $1000 per hour…at least not a legitimate one that doesn’t finish that hour with a ‘happy ending,’ anyway! Whew. You can see why I’ve given healthy people the advice I’ve learned about the hard way over the last several years: never, ever become disabled. It does cramp the lifestyle. Obviously nothing bad happened during my expedition to the doctor’s office and all’s well. While the transfers to and from my Honda were no fun as usual, it certainly was a pleasure to get behind the wheel for an outing further than my driveway for the first time in a couple of months. In my mind I knew that driving wouldn’t present a problem, but after a couple of months without exercising the skill the mind-monkey was whispering ugly suggestions that I might not do so well after that period of inaction. Happily, any doubts I might have had disappeared like wisps of fog burning off in the sun once I got on the road, and I negotiated the trip without thinking further about it. As fun as driving again was, it paled next to the enjoyable meeting last night with the couple who’d taken notice of my situation courtesy of Tom Woods’ publicizing my blog last week and expressed their desire to advocate locally for me. Caleb, the gentleman of the pair, first contacted me last week and set aside time for the visit, while his charming young wife Jes insisted on preparing a lovely dinner for the occasion. I feel well and truly spoiled by such exclusive treatment, and I’m delighted that they’re willing to help spread the word about my cause among local people and groups who might be inclined to donate to the cause. Apart from the rare opportunity for socializing for a while with people I was meeting in person for the first time, it was gratifying to welcome people into my home who only knew of my details from two dimensional text, but who have now seen for themselves that I’m the real deal. I’m sure they needed no convincing after Dr. Woods lent his endorsement to this blog and my solution for solving my dilemma, but it was a good feeling nonetheless. Jes, Caleb, I thank you two for your kindness last night, and look forward to working with you to speed this project along to get me mobile again. Meeting new friends from the online world in the real one is a real joy! Right on schedule, I’m due at the doctor’s office for another ‘routine’ visit later this morning, meaning I have to physically appear to renew the prescriptions for my various medicines. As usual, I’ll be driving, which isn’t a problem…provided I make the four transfers from my wheelchair to and from my Honda safely. This is the day I always dread, since when I’m out of my chair I’m about as agile and exposed as a snail out of its shell. I’ve said it before, these transfers make me feel like I’m roller skating on the edge of the Grand Canyon. If I fall, the drop is only a few feet, but as I’ve found from previous experience, once I begin to fall I have about no control of how it’ll go, and the concrete garage floor or the asphalt of a parking lot is what I’ll hit with my full weight. The good news is, we’re well on the way to removing this hazard from my life; the fund to modify my Element stands at about 11.1%, largely due to the influx of new viewers and donors last week when Dr. Tom Woods boosted the blog’s visibility by posting my letter asking for his help on his web site. I couldn’t have asked for clearer proof that this project is working! My job now is to keep up my requests for additional publicity from some of the ‘big guns’ of the internet that will be likely to keep the donations coming from that fraction of additional new viewers who’d be inclined to donate. There’s another factor at work: as a result of last week’s event, I’ve been contacted by some terrific local folks who are willing to advocate for me with local church and charitable groups. With this kind of help, I’m confident that we will prevail in a short time. As I’ve long known, there are a lot of people out there ready, willing, and able to pitch in for a cause like mine, once they know about it. With that in mind, I’d like to ask my regular viewers for a favor (I know, demanding l’il cuss, aren’t I? ): if you haven’t already, could you please tell just two people in your life that you think might be interested to have a look at this blog? If everything pulls together as I know it can, we can be done with the project by my next physician’s appointment three months from now. If I can regain my mobility in 3 months, not only will this dread every time a medical appointment draws near be removed, but I’ll have much of my life restored that this stupid, mindless affliction has taken from me. Three months isn’t that long a time, but with the help of the internet, we can do it. It’s a lot to ask, I’m aware, but I’ve never been in such an urgent situation before. Please help get me out of this mess. Got Change For a Paradigm? Watching a bunch of Netflix and Hulu today while on a nostalgia jag for old TV shows, I was struck by a thought that’s recurred more than once over the last few years: Someone ought to investigate how everyday human behavior has changed in response to the technological innovations we’ve seen over the past fifty years or so. I’m not talking about the very very obvious things like the savings in time we get from using email rather than the old pen-and-paper letters sent via snail mail, or the way cell phones have freed us from the physical limits of landlines, no, I’m thinking about the subtle long term effects of old memes of human culture becoming outmoded by all the fancy toys we have and what they’re capable of. A meme, if you’re not familiar, is “a unit for carrying cultural ideas, symbols or practices, which can be transmitted from one mind to another through writing, speech, gestures, rituals or other imitable phenomena,” as Wikipedia so succinctly defines it. A lot of people have the mistaken idea that humans evolve noticeably over time. They don’t, simple as that. Humans today are exactly the same as they were a hundred years ago, or a thousand. The only things that do evolve are the technologies available to us, and the memes we use to pass along cultural phenomena. It’s easier if you examine individual examples to get an idea of how insidious the changes in memes can be. To give you an idea, while watching an episode of the old Kolchak: The Night Stalker speculative fiction show from the mid-1970s (is that one from left field, or what? ), the question of who one of the fathers of modern psychology was is put to a robot, who answers right away: “Wilhelm Wundt.” So, what’s the big deal? Well, Wundt is someone who I consider one of the bad guys in history, he was the psychologist who bears much of the responsibility for pushing the awful Prussian-inspired coerced public education I’ve written critically of before. His name was surely not inserted into the show’s script by chance, I think it may well have been done by someone who wanted to help cement Wundt’s name into the public’s conscience in a positive way, one tiny little trick to casually reinforce the image of public education as a good thing. Watching other shows, I saw a lot of this sort of thing, recurring buzzwords that reinforced common ‘everybody knows that‘ concepts that have been shown to be either distortions or outright falsehoods, as pointed out by many modern revisionist historians. This sort of thing has been going on for a long time, influencing and ‘guiding’ public opinion in ways that I think have been useful to those wishing very intentionally and cynically to keep that public controlled. I wonder, though…can those responsible for such manipulation get away with it more efficiently in today’s digitized, accelerated age by hammering viewers with those misleading concepts more frequently than ever before? Or is it just the opposite, with the wealth of information available on the internet at one’s fingers, is it more difficult for propagandists? I honestly don’t know, but I think it bears watching. I can think of plenty of other examples of how radically some memes have changed, but I’ll leave that for another time. I feel like I got my meaning across, and I’d enjoy hearing what others have to say on the subject. I spent some time this past evening writing notes to a few folks who I believe could have an ability to draw new viewers in a similar fashion to the way Tom Woods’ post did, provided they’re inclined to help. It looks like that’s the best method to proceed from here since that event confirmed my theory that something striking and interesting enough to distinguish my blog from all the others out there was the missing factor to attract potential donors. His ‘publicity bomb’ of the 11th certainly yielded some amazing results, and unless I’m very much mistaken we could wrap up the fundraising needed to get my Honda modded for wheelchair access in a pretty short space if I can duplicate that a handful of times with the help of folks willing to endorse my cause and steer their fans this way. That’s why I got to writing more request letters last night. I really like this process, while it’s sometimes a bit tedious, it’s one way to contact people I admire who I wouldn’t have an opportunity to otherwise, and it might have the added effect of increasing my circle of friends, judging by all the positive responses I’ve seen. It just feels right, a wholly positive way to accomplish my goal!